1937 - William Heinemann Ltd, London - First English Edition, second state. A bright sharp and near fine copy of Maugham's tribute to the vocation of an actress. 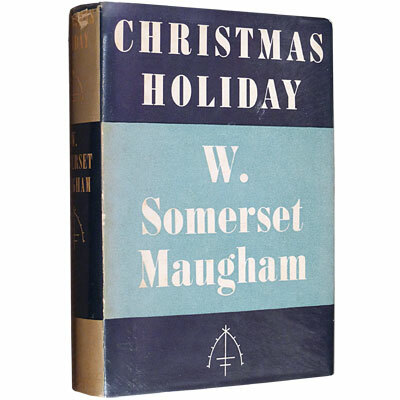 Somerset Maugham’s scarce third novel about the return of a decorated Army veteran of the Boer war, one of 1,500 copies, and the first state with Maugham’s symbol upside down on the front panel and lacking the g in ‘game’ on the last line of page 129. Somerset Maugham's classic satirical novel; a story of literary poseurs, fame, hypocrisy and freedom, narrated by novelist William Ashenden, Maugham's alter-ego who had already appeared in 'Ashenden', the fictional account of his Secret Service work in World War I. The book I like best is Cakes and Ale. It was an amusing book to write. First edition of one of Maugham’s darker tales, Paris, the Russian Revolution, a lost generation and self-destruction. The basis for the 1944 film noir, a highlight for director Robert Siodmak, starring Deanna Durbin and Gene Kelly. A fine and sharply turned out copy of the third work in the Sword of Honour trilogy.